Waitrose Farmhouse Dorset Lamb is a perfect choice for a Sunday roast. Make several small incisions in the lamb and insert the slivers of garlic. Make the marinade,coat the lamb then cover and refrigerate for 4 hours or overnight. 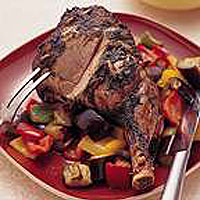 Place the lamb in a roasting tin in a preheated oven at 180°C, gas mark 4 for 55-65 minutes per kg plus 25-30 minutes. About 35 minutes before the end of the cooking time toss the peppers and the aubergine in the olive oil, season to taste and cook for 40-45 minutes. Place the potatoes in a pan of lightly salted boiling water, cover and simmer for 20 minutes, or until tender. Drain and mash until smooth with the hot milk and season. Beat in the olive oil. Keep warm until required. Remove the lamb from the oven, cover loosely with foil and allow to stand for 10 minutes before carving. Serve with the roasted vegetables and olive oil mash.